Despite it being a bright and sunny afternoon at Anfield, where Liverpool played host to Arsenal in the club’s second home game of the 2012/13 season, in metaphoric terms, it was anything but bright and sunny for Liverpool Football Club. The Reds were played off the park by their league rivals and beaten 2-0. We were out-battled, out-thought and, quite honestly, completely out-played. But in amongst the doom and gloom, there was a glimmering beam of light. The beam of light was in the shape of Liverpool’s diminutive new signing, Joe Allen. The 5’6” Welshman was superb; neat and tidy in possession, confident on the ball and intelligent with his movement off it. Allen’s impressive showing that day followed an even more domineering performance the week prior, in Liverpool’s 2-2 home draw with Manchester City. The Welshman produced a midfield display that showed patience, aptitude and poise, pulling the strings with remarkable maturity. In truth, his performances on the two occasions were reflective of a theme that developed throughout the first few months of the season. Liverpool, a team adapting to the fresh ideas and approach of a new manager, struggled for any form of consistency, but Allen was often the standout performer. He personified – and indeed personifies – the style of play Brendan Rodgers is trying to implement at Liverpool – elegant, methodical and hard working – and looked every penny worth of the £15 million Liverpool paid Swansea City to sign the midfielder. But upon Lucas’ return to the fold – having recovered from two serious injuries – and suffering from an on-going niggling shoulder injury himself, which ultimately ended his debut season in a red shirt, Allen struggled to maintain the high-level performances that excited many supporters at the start of the campaign. By the turn of the year, he was in and out of the side, and his early-season promise, to some, became a blurred memory. But that should not disguise the young midfielder’s clear potential. Allen is exactly the type of player who is often over-looked when it comes to praise and plaudits. He isn’t a player who is going to score screamers from 40-yards, he won’t dribble around four or five players and therefore, it often means that he doesn’t receive the credit he deserves. But it certainly doesn’t make him any less influential on a game – quite the opposite, in fact. As he displayed during his time at Swansea, and during the early stages of last season with Liverpool, Allen has the ability to dictate the tempo of a match and control games. In the aforementioned match against Manchester City, Allen’s passes found a teammate 93.5% of the time and against Arsenal, the following week, that percentage only slightly decreased to 93%. His pass completion rate at Swansea, the season prior, was one of the highest in, not only the Premier League, but in Europe, and he also made 2177 passes that season – 856 more than the average midfielder (via The Telegraph). Those statistics go some way in illustrating Allen’s ability to dominate the midfield and retain possession for his team – and, of course, without possession, the team cannot score goals. His greatest strengths are in his passing ability, his composure on the ball and his reading of the game when not in possession. He gets the ball and gives it, and although it might not look as flashy as Suarez poking the ball through a defender’s legs before unleashing a fierce shot, his strengths are crucial in the overall context of the game. How is Suarez supposed to produce moments of magic, unless a player like Allen steals possession from the opponent and gives it to him? The 23-year-old’s shoulder injury no doubt had a significant impact on his form, but even during his positive start to life on Merseyside, Allen wasn’t playing in his strongest, most natural position – being the only compatible midfielder to play in the defensive midfield role, usually occupied by Lucas, he was the player asked to fill the void in the Brazilian’s absence. In my opinion, the best role for Allen is the position that Steven Gerrard currently plays in – the deep-lying playmaker, situated slightly ahead of the defensive midfielder – where he can bind Liverpool’s play through the middle and keep things ticking over, without having to take on so much of the defensive responsibility that comes with playing in the holding role. I can see Allen being nurtured to slot into Gerrard’s position, when the Liverpool legend eventually decides to follow Jamie Carragher into retirement. It would be unfair to put pressure on Allen to become Gerrard’s successor, but I certainly see the position being perfect in unlocking the full potential of the Welshman and making best use of his qualities. At Swansea, he played between the most advanced midfielder and the deepest midfielder, providing a link between attack and defence – and that’s exactly the role he could play for Liverpool. After the match against Manchester City, Rodgers effusively praised the efforts of Allen, saying: “He’s five foot six but in terms of a footballer, he is seven foot six. He is absolutely immense – his courage to get on the ball, his body work is fantastic; how he reads the game, his football intelligence. This kid will play at the top and is playing at the top.” Note the emphasis on kid. Next season, providing he can steer clear of injury and with the full backing and patience of Liverpool supporters, I’m confident we will see the young midfielder controlling matches, like he did against Manchester City, on a consistent basis. At only 23-years-of-age, the future looks bright for Allen – the best is certainly yet to come. Jack Wells is a qualified journalist and football writer. He has been a regular contributor to Back Page Football since 2011 and writes about all things football, whether it is in the form of opinion pieces, tactical analysis or investigative articles. Back pass Allen is truely one of the worst signings LFC have ever made ( £15 million pound is a joke ) Hopefully we can move him on this transfer window,but I guess we’ll only get back less than half are investment.Most LFC fans know he brings nothing to as team & club,and want him sold ASAP. Re: the idiot who thinks he talks for everyone saying he should be sold and is rubbish. When you have played at an educated level, coached or done anything worthwhile for football (doesn’t include criticising from the stands with a pint in your hand or even not leaving the sofa)… Only then do you deserve the right to cast judgement over LFC players. Until then, support the club! Allen had a good 1st half of a season IMO and is unfortunately British so is a few million pounds over priced. Can grow into a fantastic player for the club. Most LFC fans want him sold ASAP? Where are they all? Er, Danno. ‘Most LFC fans’ think he’s pretty good or are at least waiting to make their minds up, mate. I completely agree with Danno. I think most LFC fans do want him sold. You’d have to be on serous hallucinogenics to think Allen was or is “superb, neat and tidy in possession, confident on the ball and intelligent with his movement off it” Plus being of hobbit-size stature, he’s lacks the physical presence to command a midfield. On too many occasions I remember opposing players shrugging off his attempts at a tackle like he was some kind of gnat. Perhaps he would excel in another arena, such as La Liga, but never in the EPL. joe allen epitomises the club these days, abject mediocrity dressed up as “re-building” or a work in progress or whatever the latest pr spiel is thats flooding out rodgers mouth on a daily basis for those willing to listen to another one of his toe curling sound bites. make it stop pls. 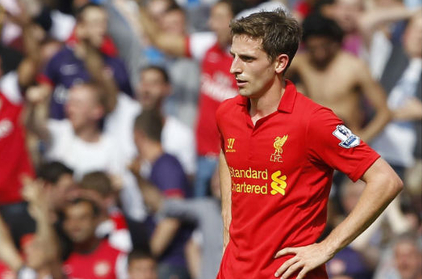 Is there a player that divides opinion as much as Joe Allen seems to do? I didn’t realise he did, at least not to this degree! Personally, I can see why the uncertainty is there but I’m willing to give him and Borini another season with the injuries they had and I don’t see the rush in offloading international players in their early 20s, especially as there are more pressing issues to deal with. Unfortunately our fanbase have become impatient and don’t give young players time to develop. Lucas and Henderson as prime examples of how scathing and unpredictability of the fan base at the moment. Watching highlight packages of games or watching a match in a pub doesn’t give you full attention on what goes in a game. At 23 years of age, Allen has a role to play and Rodgers knows his abilities. I believe a manager of Rodgers experience and qualities knows more than any of us. We paid over the odds on Allen was caused by a number of things one specifically that despite the british tag, the newly appointed manager of LFC was going back to his old club to sign the player. Swansea knew we desperately wanted him and upped the price. Moyes is facing that problem now with Leighton Baines. They were not good purchases at the price or role and the midfield remains weak defensively regardless of their potential. It’s a consequence of Rodgers’ inexperience and his lack of defensive nous could be his undoing. Every top manager has a strongly defensive team – Rafa reduced goals conceded by 25% for example, which made it possible to have success. Rodgers has to learn that but if he doesn’t score enough in the meantime, will not progress up the league and that will cost him his job. Mission Impossible – can Russian players survive abroad?